The 'In Death We Trust'-festival, praiseworthy and mournful at the same time. 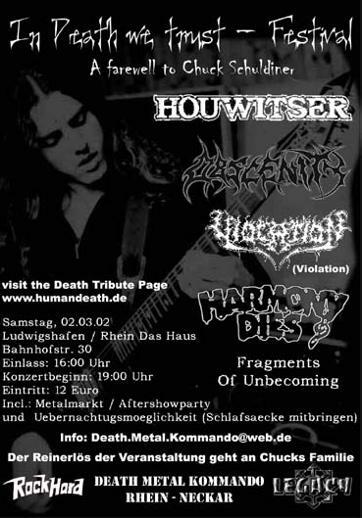 Praiseworthy because the 'death metal command Rhein-Neckar' planned this festival to raise funds for Chuck Schuldiner, to help finance his cancer therapy. Mournful though because the help came too late, he died December last year. Yet the money will help the Schuldiner family to pay some of their bills. Five raw bands, who just got their travelling costs payed, reported themselves. No wonder there was an old ambulance in parking lot of the former House of Youth in Ludwigshafen, which was converted by means of black paint into a real death metal monster. The fist band STIGMATIZED from Cochem, climed the stage. They were the replacement for the initially planned Violation. After the intro -Carl Orff's 'Carmina Burana'- died out, Stigmatized showed themselves to be skilled musicians, who presented their technical death/thrash very well. Besides they showed over and over they're certainly influenced by Death. As conclusion to the show they played two Death pieces, 'Leprosy' and 'Genetic Reconstruction'. With FRAGMENTS OF UNBECOMING the spin-off of the local cracks Veneral Disease followed, who also offered very appealing melodic death metal. They played fast without getting sloppy. Which was unthinkable anyway because they showed off strong, well thought out guitarparts. Obviously the band felt obliged to At The Gates and Dissection, from whom they played the covers 'Blinded by Fear' and 'Nights Blood'. HARMONY DIES, specially flown in from Berlin, sent their singer, Christoph Carl, with a monster mask on stage for the first songlines. Although a grin could not be surpressed there was no denying that Harmony Dies is a very professional band. All band members got to the front of the stage right away, throwing themselves into the vents. As a result causing already from the first song a substantial mosh-pit, and it soon showed that you only need three submissive friends to surf the crowd. Harmony Dies played a convincing show and ended with the Chuck-tribute-cover song 'Defensive Personalities'. Then the sound system was turned up and some more lights were put into position. Although it must be said that all bands at this festival played under the same, very good, conditions. Only with the two main acts just a little more was added. OBSCENITY knew how to take advantage of it. They fully played out their experience from their six studio albums and the matching gigs. They let their double-flying-V-squadron scream over the stage, played tight and soon proved to be the grooviest band of the evening. Unfortunately the crowd already seemed to be a bit tired, because only in the frist few rows there was some physical metal activity. Yet the Oldenburgers came back for an encore. The Dutch HOUWITSER turned up in Ludwigshafen when the first act was already on stage, so they couldn't do a soundcheck. Therefore rebuilding the stage took forever. During the gig the band had huge technical problems, and no one tried to shorten the long intermissions. It was not very professional. They'd better start throwing their frustrations into their stage act, Houwitser came across as very boring and compared to the other bands they were definitely the weakest. Yet the fans enjoyed themselves and were very occupied with crowd surfing. In the light of the current world politics it can be questioned whether their military outfit was a good idea. The Houwitser set was a disappointment, so it wasn't too bad they could only play for half an hour because of the venue's closing time. Yet the last set can't cloud the 'In Death We Trust'-festival at which the fans peacefully remembered Chuck for over 5 hours and hopefully gathered a considerable amount of money for Chuck's family.